Having a toddler around the house, especially one who is as active as my little guy, really can make you cringe at times. In fact, I'm really surprised we haven't had more bumps and bruises than we have had so far. Noah usually recovers pretty well from his little trips and tumbles. I'm always quick to say, "are you OK?" or his favorite "SAFE!" and he always jumps up and shakes it off like it was no big deal. But I did have some insight into his little world a couple of weeks ago. I was on my way to the gym early in the morning and it was freezing outside, so I started jogging just to get there faster. I had a hood on and it was pretty early and for no reason I just tripped on my feet and TOTALLY ate it! I fell so hard that I ripped my gloves and both knees were all torn up. And my initial reaction was to think of Noah and how often this happens to him. Granted, he has a shorter distance to fall than I do, but when you're not even bracing yourself at all, it freakin' hurts! Anyway, I've been much more sympathetic to his falls ever since I had my own kaboom. So, today after breakfast we usually go straight to the bathroom to wash up and brush our teeth. Noah loves to be chased and he thought it would be funny to run as fast as he could to the bathroom saying, "gettchoo, gettcho!" He ran so fast that when he got to the tub, he didn't stop and he fell face first over the side of the tub. Yikers. As I'm writing this, I still can't get that mental picture out of my head of his little legs up in the air over the side of the tub and I really do have to laugh (sorry, mom). In any case, he recovered really quickly after I was trying to make him laugh and said, "did you go kaboom in the tub?" He thought that was hilarious. And now everytime he goes in the bathroom he says, "kaboom... tub!" (followed by "head... hurt!" and makes a sad face). HA! just thought that was one for the books (or the blog in this case). today celebrates my 1 year blogging anniversary. I want to thank all of my blogging friends who motivate me to keep posting and to all of my devoted readers... without you, this blog would not be possible. me: So, do you have anything you need to do tomorrow? Jon: Um, no. But, I'd really like to sleep in, workout, sit on the couch and watch sports, and then go out to dinner and a movie. What about you? me: Yeah, I was thinking that I could sleep in, go workout, go shopping, and then go hang out at a cafe and read my book... then maybe we could meet up and go to dinner and a movie. Jon: That sounds nice... but what about Noah? As nice as it would be for both of us to have our pefect Saturdays every week, it's rare that either of us ever do. We usually trade off who gets to sleep in and every once in awhile one of us will go out on our own (it's usually me :) and we pretty much never go out to dinner and a movie. I know, I know... that's the nature of the game and we really need to get over it. I guess we need to start differentiating between the perfect "me" Saturday and the perfect "family" Saturday. Well, we go pretty close this past weekend to the perfect family Saturday. It was completely unplanned and it turned out to be a great day. We took turns working out in the morning and then after Noah's nap, we headed down to Central Park to wander. We came across the Zyrtec Spring Wonderland Dome (a ridiculously shameless pharmaceutical ad campaign) where Noah got a free carousel ride and then we wandered through the park. Noah had a great time. He's finally at the point where he can walk pretty long distances without getting tired or cranky. So, that was a great way for him to expend some energy and it wasn't too terribly cold out. We actually got him to wear a hat, which is a feat in itself, and he was really excited about posing for pictures for some random reason. Then we wandered over to the new Magnolia Bakery on 69th and Columbus (hooray for the Upper West Side!) where Jon stood in line and Noah and I thawed out at Barnes and Noble. We ended up getting there right in time for a free Little Maestros performance where Noah was completely mesmerized and had a blast. so, what's your perfect Saturday? Every Monday I hold a small playgroup at our place with some of our neighborhood buds. It's been a really fun way for Noah to socialize with some other little guys his age and I've had a blast preparing little lessons for them each week. We had a special treat this week because gma S. scored us some free tickets to the Museum of Natural History. So, we took advantage of those and had a great time! They LOVED seeing all of the animals (and had no idea they weren't actually alive) and running crazy through the exhibits. We hit the African Mammals, Hall of Biodiversity, the special water exhibit, and the dinosaurs, of course! A good time was had by all and they even cooperated for couple of group shots! there were a lot of "Oh, wow's!" Cameron LOVES to chase Noah! Today the high temp here was 25 degrees so I decided to add some additional layers to Noah's usual church outfit. I think I probably enjoyed watching him run around in tights WAY too much. Jon said that I'll be held responsible if he turns to cross-dressing. but, who can resist those chubby little legs in spandex? I have always been a shopper. For most of my life up until about 2 years ago, my shopping obsession has been mainly focused on clothes, shoes, accessories, etc. for me. Occasionally when we've moved into new apartments or done some re-decorating, the obsession had shifted to home decor/appliances. But it usually never lasted long there -- and I still always had something in the back of my mind that I was wanting. Call me superficial and worldly, but I call it being a girl. But something happened as soon as I got pregnant with Noah. All of that shopping energy shifted dramatically to my unborn child. I went through some SERIOUS nesting phases (we're talking carrying around a tape measure and a diagram of his nursery in my bag just in case I saw something for Noah and I needed to make sure that it would fit in the space). Well, I have to take some of that back... I was pretty obessed with buying maternity clothes, but that was more out of necessity because I was so huge and I would grow out of things on a weekly basis. And really I wouldn't call that shopping for me anyway... it was soley because of the baby! In any case, I have been seriously shocked and surprised (as has my husband) as to how much my shopping obsessions revolve around Noah. Christmas was a good example. I've always been a pretty high-maintenance Christmas present girl. It's taken Jon a good 8 years to figure me out (ps -- you totally scored with those slippers this year, babe!). But this year, I really didn't care at all. I was pleasantly surprised as to how thoughtful everyone's gifts were, but I really wasn't expecting anything and I was fine with it. I really think that's what made this Christmas so nice -- no exectations, only gratefulness. Anyway, I seriously obsessed about what to get Noah starting way back in October. I wanted the perfect gifts and went to any length to find them. As you clearly saw on the video of him opening a puzzle on Christmas day, he could've cared less, but it was such a big deal for me. I love finding him toys and books that just light up his face and clothes that I think he would look super cute in. 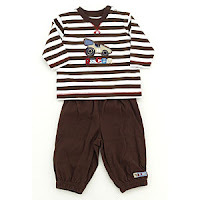 So, now I have to admit my most recent Noah shopping obsessions -- Little People toys and Carter's playwear. I want to collect all of the Little People toys and create an entire Little People town in Noah's room. I know... it's completely ridiculous. 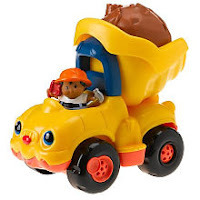 I spend way too much time searching "little people vehicles" on ebay (I just lost my bid for the best lot ever!) when I know that Noah is perfectly content with the stash of Little People toys that he already has. And for some reason I've been drawn to Carter's clothes lately. I never really dressed him in Carter's stuff when he was an infant because I thought he looked cuter in clothes that made him look older. But now I want to dress him in these little babyish outfits (I've obviously got some major issues with him getting older right now!) -- I can't get enough of them! So, call me superficial and worldly, I guess it's just called being a mom. In any case, life's been kinda dull around here, but we've tried to come up with a few ways to make things more interesting. The following are some recent celebrations/activities that are worth mentioning. Jan. 14th: Jon and I celebrated our 8th anniversary of the day we first met. I'll always remember the date because we met on my best friend's birthday. We went party hopping and ended up at Jon's house. My friend quickly picked out "Jonny" (as his roommates used to call him) for me and the rest was history. He looked was so cute in this weird hat he was wearing as he DJ'd the party and I was hooked. Jan. 12th: My older brother visited from Utah last weekend. Then my little brother came down to hang out with us too. The 3 of us went to the MOMA and I got to do some unusual city wandering without the baby in tow (hooray!). We had a fabulous time and then met my parents and Jon and Noah for dinner at our favorite Ethiopian restaurant. yum. Jan. 16th: Noah turned 20 months old. I am having serious issues actually saying that he's 20 months old. I don't like it at all. I couldn't wait until he was 18 months, but ever since then I'm ready for time to SLOW down. He's getting so big and talking so much these days (stay tuned for an updated video). My favorite 20 month old story so far was when he woke up crying in the middle of the night unconsolably and Jon went in to pat his back and see if he would calm down. I was in the bedroom listening to the monitor, when I thought I heard him say "poo!" amidst the screams. So, I went in to the bedroom and checked his diaper --sure enough he needed a diaper change. He went right back to sleep after that. Hooray for communication! Now, why couldn't he have done this when he was an infant??? stay tuned, though -- exciting things coming: Jon's fam is coming to visit in 2 weeks!